Now with completely new user software and ActiveX control software toolkit! 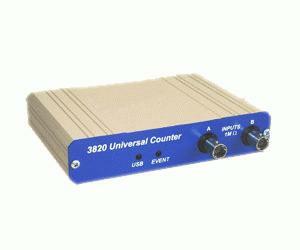 The counter is principally intended for counting bi-level signals, which have two distinct voltage levels and clean transitions between them. Such signals include those generated by all common logic families used in electronic circuits, as well as most Trigger or Sync outputs of common test instruments. Measurements are updated at one of five user selectable intervals in the range 5 ms to 100 ms. The module is powered and controlled directly from the USB port of the PC, so requires no additional power source. Operation is entirely via software, with no manual switches or settings. Two inputs are provided, each connected to a separate discriminator with adjustable threshold in the range –0.2 V to +0.5 V (–2.0 V to +5.0 V when used with a x10 probe). Following the discriminators, a multiplexer selects one of the signals for processing, allowing two different signals to be measured sequentially.